The closing comes at a time when the Institute is facing budget cuts following poor investment returns and a drop in MIT’s endowment from $5.4 billion to $5.1 billion. President Charles M. Vest, whose 13 years at MIT were marked by a dot-com era building boom and a sequence of high-profile deaths that brought dramatic changes to student life, is expected to announce today that he is stepping down, Institute sources and a student leader said. The news was first reported by The New York Times. 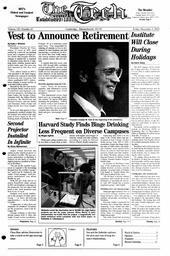 Analyzing data from 114 colleges in the United States that participated in four College Alcohol Study surveys from 1993 to 2001, researchers found that binge drinking rates of white males and underage students were significantly lower in schools that had more minority, female and older students. Dr. Henry Wechsler, director of the Harvard School of Public Health College Alcohol Studies Program led the study. “We put up the corridor 4 projector to respond to the increasing demand from the corridor 3 projector,” said Louis W. Graham Jr., the Audio Visual manager. Each projector installation cost about $8,000, he said.